What Have We Learned from the Past Decade of Scaling up Zinc and ORS? A mother in Uganda gives her 3 year old daughter, Naume, ORS and zinc for her diarrhea and she recovers quickly. She is well again and loves playing with her two older sisters. Photo credit: Melinda Stanley, Clinton Health Access Initiative, Inc. In 2004, UNICEF and WHO updated their guidance for the treatment of acute diarrhea by recommending a combination of zinc supplementation and oral rehydration salts (ORS). Where have we come since then? Significant global and political attention has raised the profile of this simple, highly-effective, and affordable solution and its potential to save the lives of children. For example, the UN Commission on Life-Saving Commodities for Women and Children named zinc and ORS as two of 13 essential commodities. 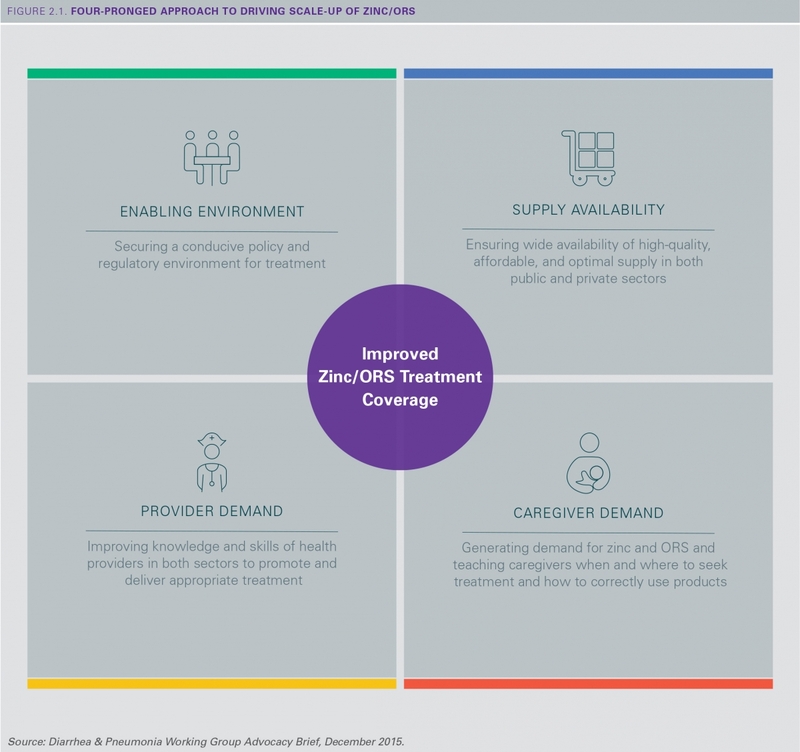 The Integrated Global Action Plan for Pneumonia and Diarrhea (GAPPD), accompanied by a Lancet Series, updated and provided the evidence-base for an integrated framework of interventions for pneumonia and diarrhea, including zinc and ORS. Partner networks representing the NGO, donor, academic, and private sectors—including the Zinc Task Force and the Diarrhea & Pneumonia Working Group, among others—have come together to address global and regional barriers to access. Most importantly, governments and local partners have demonstrated unprecedented leadership and commitment to reducing child mortality in their countries by increasing access to and use of zinc and ORS. A review of progress across the 10 focal countries of the Diarrhea & Pneumonia Working Group have shown notable improvements in treatment coverage, national policies, and care-seeking behavior compared to other countries. In spite of this progress, there is much work that remains in order to further reduce child deaths. So, what can we learn from the high-performing countries? 1. Securing a strong enabling environment: A national scale-up plan—in line with GAPPD and other global frameworks—helps to align government and partners around a common framework and a government-led national coordinating mechanism can drive its implementation. Achieving over-the-counter status for zinc is also needed to ensure the products can be widely distributed and marketed to consumers. 2. Improving availability of supply: The local market for high-quality, affordable, and optimal zinc and ORS products has improved dramatically, particularly in sub-Saharan Africa, with the introduction of new suppliers. In the public sector, robust forecasting, procurement, supply chain, and distribution practices help to ensure a consistent supply for health facilities and community health workers. In the private sector, partnerships with actors along the supply chain expand the reach of products to rural areas where most children die from diarrhea. 3. Generating demand among caregivers: A strategy informed by the latest market evidence and tailored to address local barriers has the greatest potential for improving awareness and usage of recommended products. Updating product packaging and presentations also has a strong influence on consumer appeal and adherence. 4. Improving knowledge and skills of providers: Frontline workers (both public and private sector) —often the first and only point of care for child diarrhea in remote areas—should be adequately equipped with the knowledge, skills, and motivation needed to manage and treat diarrhea. Bangladesh has demonstrated that this ‘four-pronged approach' works. Today, an increased number of children with diarrhea are receiving the correct treatment, with 77% receiving ORS and 44% receiving zinc. Each year, over 500,000 children still die unnecessarily from diarrhea and governments, donors, and partners have invested significant time and resources to tackling this problem since 2004. More is needed to achieve high coverage levels. We have a responsibility to focus our next investments on what works (and learning from what doesn't work) to continue to drive large-scale change and ensure children with diarrhea receive the correct treatment.